Huawei has today launched its latest dual camera lens smartphone under the Honor branding at an event held in New Delhi. It is named Honor 8, with the number when tilted representing the two lenses at the rear. 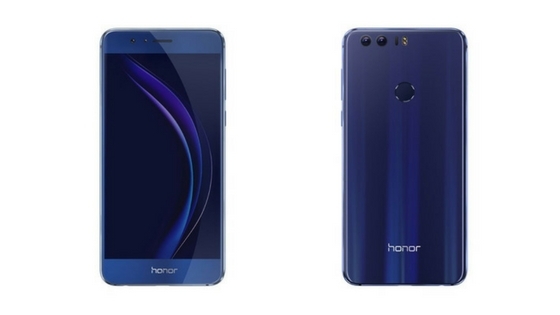 Two other devices, Honor 8 Smart (a toned-down variant of the Honor 8) and Honor Holly 3 (first Honor phone to be made in India) are also launched. The most marketed dual camera used in the smartphone is f/2.2 12 MP lens with dual tone flash and laser autofocus - one of them is an RGB color lens while the other is a monochrome one. The front camera is a f/2.4 8 MP shooter. Honor 8 is a sleek and elegant looking device with a double-sided glass design. It runs on Huawei's custom skin, Emotion UI 4.1 on top of Android 6.0 Marshmallow. The device comes with USB Type-C and supports single nano SIM with 4G LTE. A 16-nm Kirin 950 octa-core chipset (four of them clocked at 2.3 GHz, while the rest four at 1.4 GHz) powers the device. It draws its power from a non-removable 3,000 mAh battery (no fast charging support) and has 4 GB RAM with 32 GB internal storage and up to 128 GB external storage support. The display used is a 5.2-inch FHD panel. There is a fingerprint sensor on the rear. Not only does it provide an extra layer of security, but also lets one create shortcuts to perform various actions with its Smart Key feature. The fingerprint module is a button (meaning it can be pressed)! One can customize the actions it must do when pressed once or twice. Huawei has put some extra thought in the after-sales service of the product. The smartphone has a two-year warranty as opposed to the traditional one-year warranty. Also, the touch screen is replaceable within the first three months. Huawei Honor 8 is available in gold, blue and white color options. It is priced at ₹29,999 ($450 approx. ).